Nations Trust Bank American Express credit card announces a special promotion for their credit cardholders to enjoy 40% saving on hotel stay till 31st July 2016. The 40% discount offers are valid for Cinnamon Lodge Habarana, Cinnamon Bey Beruwala, Cinnamon Citadel Kandy, Cinnamon Wild Yala, Habarana Village by Cinnamon, Trinco Blu by Cinnamon, Hikka Tranz by Cinnamon and Bentota Beach by Cinnamon. Offer valid for stays till 31st July 2016 and reservations are open till 30th June 2016. 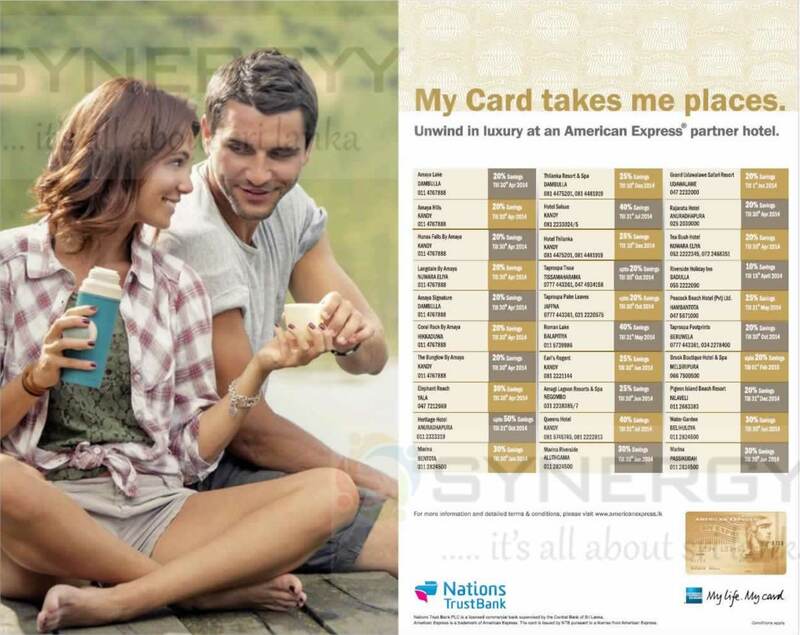 American Express announces a range of hotel promotion for this forthcoming Holidays in November, December 2015. 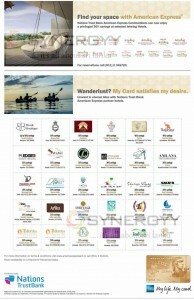 Enjoy your special discount from 15% to 50% off only for American Express credit card at below hotels. The promotion is valid for bookings made & stays confirmed during specified period (inclusive of both days). One Cardmember is eligible for a maximum of 2 rooms per hotel per booking. However the number of nights can be differed on availability. Savings will be applicable for Double or Triple rooms booked only on Half or Full board basis. However there will be exceptions on the below properties. At CALAMENDER BAY – TRINCOMALEE the saving valid only on FB basis & 20% savings on two night stays at all “Taprospa” properties. At Hotel Pledge3 offer valid only for platinum card members. Rooms will be given on a first come first served basis, strictly subject to availability & confirmation. The card member(s) is/are to settle the total bill via American Express Credit Card to be eligible for the savings. Savings applicable on local room rates and valid for Sri Lankans and Expatriates only. Offer is not valid for online bookings and long weekends. Reservations to be made in advance by calling the specified numbers. An advance payment is to be made by the Card member using his/her Nations Trust Bank, American Express Credit Card at the time of the reservation. The savings is not applicable for pre confirmed bookings made prior to the respective launch dates. Standard Child Policy, Cancellation policy & Peak Supplements of the Properties will continue to apply. Limited number of rooms available. The type of rooms available (Single/ Double/Triple) and the basis on which it is offered (BB /HB/FB) will be in accordance with the standard policy of the individual property. The offers cannot be exchanged for cash and/or used in conjunction with any other promotional programs or offers provided by service establishments involved in this promotion. Nations Trust Bank PLC reserves the right to withdraw, modify or change all or any of the rules, terms & conditions applicable to this promotion at any given time without prior notice. If any dispute arises regarding any of the terms and conditions contained herewith, the decision of the respective service establishment & Nations Trust Bank PLC shall be final. Nations Trust Bank PLC accepts no liability for the quality of goods and services provided by the service establishments involved in this promotion since the Bank is not the supplier of such goods and services. The General Credit Card terms and conditions will continue to apply. The promotion is bound by the terms & conditions of the respective service establishment and Nations Trust Bank PLC. 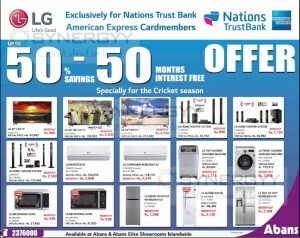 Abans offers a special 50% off and 50 Months Interest Free shopping experience for the American Express credit card in this ICC World cup Cricket season. Now you can say that i look after my health, my card looks after me. Yes enjoy 12-month interest-free installment plans at any gym, spa or fitness equipment retailer as well as super savings on select wellbeing purchases! The offer is valid till 28th February 2015 and Terms and Conditions apply. The Amex Credit card offers great deals for your vacation and holiday moods; take short leaves and enjoy your days at listed hotels below at a best price till December 2014*.